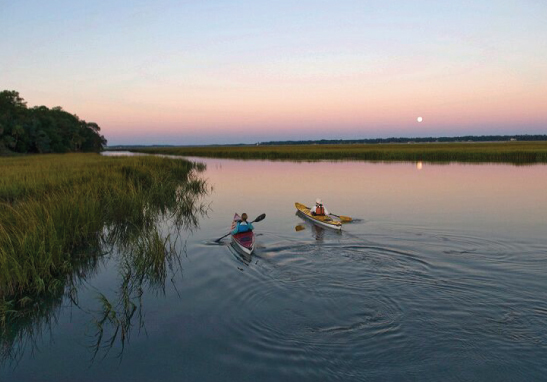 Enjoy the natural beauty, history and culture of the Lowcountry with the Outside Palmetto Bluff Guides on a backwater kayaking adventure. No experience nessecary. This is a beautiful and serene 2 hour nature tour, in the moonlight, along the pristine May River. No kayak experience is necessary. On this casual tour, you'll explore the local creeks with an Outside Palmetto Bluff naturalist guide. No kayaking experience is necessary. This trip is 4 hours total, with about 2 hours of kayaking. The Outback is a one of a kind trip! Your trip starts with a scenic boat cruise from Palmetto Bluff, through the back waters of the area to our private and remote Page Island, where kayaks are ready for this distinctive tour. The peaceful creeks that we paddle on the undeveloped side of Daufuskie Island are rich with the telltale signs of Indian settlements from the 1700's. The scenery is breathtaking.